Well. That rather surprised me, and I’ve been thinking about it ever since. It doesn’t surprise me that I care about the world – things, people, place – I have a curiosity about all sorts of things. What I hadn’t connected, was that I write to help to understand. Why do I write rather than think? Well, I think that’s so that I can’t escape the thoughts, when they’re written down, you can see in front of you what you thought, and thought, and sometimes in thinking around something, writing about it, you visit it at different levels. Rather like peeling back an onion skin. 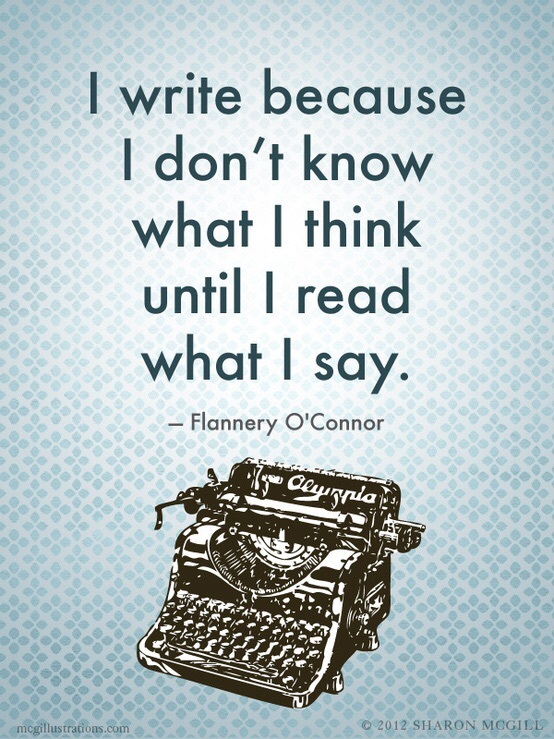 I have some sympathy with this Flannery O’Connor quote. I’m a keen journaller, which I know helps me stop things circling in my head. I love writing when we go travelling – to capture place, thoughts, reflections as a permanent record. In moving from the real world, of non-fiction writing to fiction writing, I’m struck that what I write seeks to make sense of something, explain something. There’s more to writing, for me, than telling a story, it’s about an intention to create something that will impact, and perhaps change in the reader. This week I heard that I’d been shortlisted in one competition I entered (44 entrants to 8 shortlisted to 3 winners), and I’ve won another (more details on that another time). I’m thrilled with both. It’s a real boost to my inner-critic, and a validation that what I write, and the way I write, is well received. Repeating a comment that came from the organiser of the Bridgend Writers’ Circle, keep writing….